With the Link Aggregation enabled, Synology DS2411+ delivers an average 165 MB/sec writing speed under RAID 5 configuration in a Windows environment, and 195 MB/sec reading. The 2 LAN with failover support and hot-swappable drives will ensure continual service uptime should the drives need replacement or the unexpected LAN failure. SKU: DS2411+12TB83 Category: Ultra High Performance 12 Bay NAS Servers. With the Link Aggregation enabled, Synology DS2411+ delivers an average 165 MB/sec writing speed under RAID 5 configuration in a Windows environment, and 195 MB/sec reading. The 2 LAN with failover support and hot-swappable drives will ensure continual service uptime should the drives need replacement or the unexpected LAN failure. Businesses need a strong foundation to face mission-critical tasks, so the Synology DS2411+ delivers high-performance with high data availability ensuring access when it’s needed. Windows ADS integration allows the Synology DS2411+ to quickly and easily fit in an existing business network environment with no need to recreate users’ accounts on the Synology DS2411+. The User Home feature minimizes the administrator’s effort in creating a private shared folder for a large amount of users. Windows ACL support on DS2411+ provides much finer-grained access control and efficient privilege settings, allowing IT staffs to set up privileges to files and folders on DS2411+ through their familiar Windows user interface. The privileges set on Windows ACL will be applied to all access entries, including AFP, FTP, File Station, NFS and WebDAV. The secure privilege offers IT staff peace of mind, no worries about any loopholes. With the iSCSI support in DiskStation Manager (DSM), the Synology DS2411+ provides a seamless storage solution for virtualization servers, such as VMware, Hyper-V, and Citrix. It is the ideal alternative to SAN solution for businesses. Affordable and cost-effective, iSCSI allows SMB users to consolidate storage into data center storage arrays while providing hosts with the illusion of locally-attached disks. When the storage capacity of the Synology DS2411+ is nearing its limits, it can easily be expanded by the Synology DX12113. The Synology DX1211 securely connects to the Synology DS2411+ via an Infiniband cable that carries 12 Gb/s SATA signal to ensure maximum throughput. 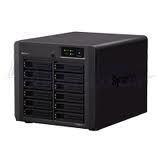 The Synology DX1211 can directly expand the existing storage on the Synology DS2411+ to a maximum 72 TB capacity. The Synology DS2411+ runs on the renowned operating system, Synology DiskStation Manager, offering comprehensive applications and features designed specifically for businesses. Comprehensive network protocol support assures seamless file sharing across Windows, Mac, and Linux platforms. A wealth of additional features allows the Synology DS2411+ to replace several pieces of network hardware. Synology Web Station with support for PHP/MySQL content allows for the hosting of up to 30 websites on a single Synology DS2411+. Synology Surveillance Station offers a centralized interface to safeguard the office environments by deploying IP cameras throughout the network. The built-in Mail Server turns a Synology DS2411+ into a mail server with only few steps of installation and the USB printer sharing capability minimizes businesses’ printing cost by sharing printing resources throughout the office. Synology DiskStations are designed and developed with energy efficiency in mind. Compared with the average PC counterparts, Synology DiskStations consume a relatively low amount of power and have the hard drives hibernate when not in use. 1. With Link Aggregation enabled. The performance figures could vary on different environments. 3. 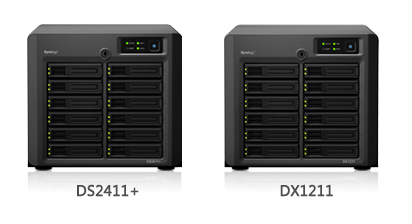 DS2411+ supports up to one Synology DX1211.